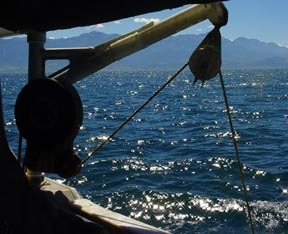 On this the fifth day of the trip, and I made two forays out into the Pacific from Kaikoura. The first was a Whale Watch that stretched from 7:45 in the morning until about 10:30. 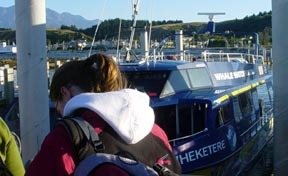 We went out on one of Kaikoura Whale Watch's three double hull, luxurious tour boats, and in the course of the morning got good close looks at three sperm whales. The conditions were ideal. Although my camera is not the best for the job, you can see that the whales were impressive. Before leaving from the Kailoura Whale Watch Center, the sun was coming up over the South Pacific. 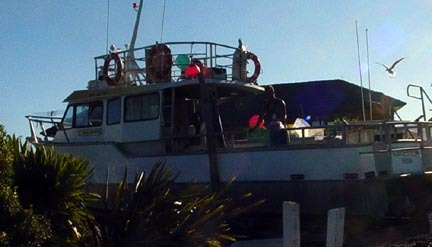 After about 50 people boarded the vessel, "Wheketere." we were underway. Incidently, Wheketere is a Maori word, and in the Maori language, a leading "Wh" is pronounced like an "F". It didn't take long before the first Sperm Whale was spotted. The coordinates were: 42o 30.222' S; 173o 37.048' E.
Notice how close this animal is to land. Only in New Zealand and the Azores do deep canyons, favored by Sperm Whales for feeding approach this close to shore. The water depth here exceeds 1000 meters. 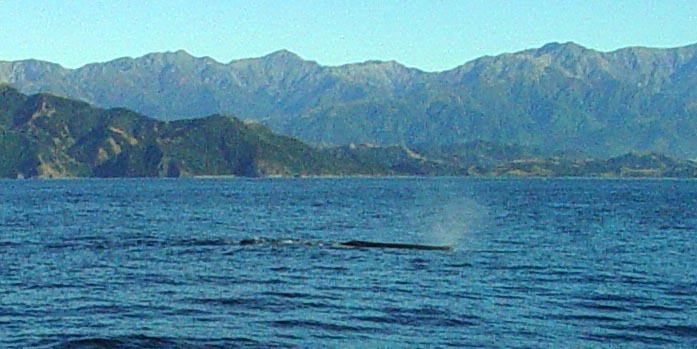 This is a large bull whale, resident in the area, and well known to the Whale Watch people. He spouted at about 20 second intervals for about 15 minutes after we arrived, and then gently dove. Shortly another whale was spotted a mile or two away. This was another bull, again one of the residents.  He was spouting at shorter intervals, and dove after a few minutes, showing his flukes as he went down. 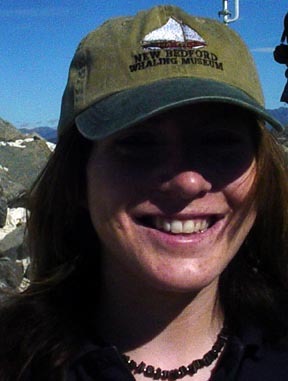 The coordinates were: 42o 30.500' S; 173o 37.318' E.
Back at the dock we presented Jen, the "docent" on the trip, with a souvenir from the New Bedford Whaling Museum. She was happy to have it! 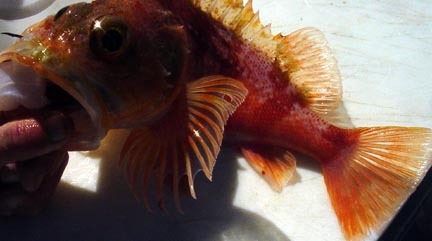 Later in the day I joined a fishing trip aboard the “Takapu” that moved off the Kaikoura peninsula for a few miles, and spent 4 hours in the afternoon, fishing for sea perch and blue cod. We caught a bunch of them, and also a few other fishes—spiny dogfish, a scup, a couple of wrasses, and saw a wonderful 7 foot blue shark. This is the "Takapu", an 11 meter aluminum vessel, resting on a trailer that is hauled to the water and launched in a nifty fashion, with all hands aboard . It is recovered at the end of the trip in an equally unique way. Our quarry were ground fish, but on the way out, the captain pulled several pots for the local crayfish (Spiny Lobster, Rock Lobster) which is a New Zealand delicacy. Enough were caught to present each of the fishermen with one. 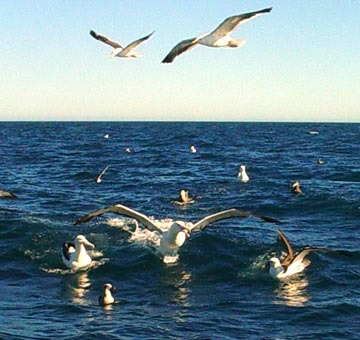 Most impressive, though, were the sea birds, many of which came right up to the boat. 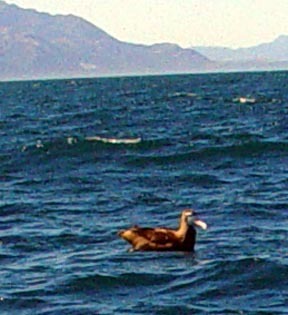 These included Wandering Albatross, Shy Mollymawk (an albatross), Northern Giant Petrels, Cape Pigeons, many other petrels and shearwaters, and all the local gulls. Here are three Shy Mollymawks, gathered around a Wandering Albatross. When bait was thrown to the birds, the intensity got pretty high. This Wandering Albatross is not to be denied. All in all, it was another wonderful day. The weather was perfect, the company great, and the scenery magnificent. Lots of neat animals too! Tomorrow morning I head across the South Island to the town of Westport.